AJ’s next target is MGD beer. “Probably the most blatantly illegal advertisement came in early 2009, when a new beer called MGD 64 (boasting just 64 calories) sponsored an online fitness program…” With a claim like that it would be nice to know what makes it “illegal,” if not the imagery of “a thin, toned brunette in a party dress, smiling brightly as she showed off the beer-sponsored body that users could obtain if they joined.” With little analysis or evidence, AJ summarily concludes that the marketing is “patently false and misleading.” By contrast, in my opinion, if you are going to strip most of the calories and body away from a beer, down to a puny 64 calories, you darned well have the right to market it as only 64 calories (especially when the same amount of milk, apple juice or regular beer would have 2-3 times as many calories). The “Industry Watchdog” lays much of the blame for this sorry state of affairs at the feet of the industry’s failure to properly regulate itself: “Finally, the most important reason for the breakdown in regulatory oversight is the continuing charade of voluntary self-regulation.” AJ says the industry has “created a system of codes, largely designed to convince policymakers they do not need to intervene, and that the industry can monitor itself” and the system is not working. But AJ would be no happier to have TTB calling the shots. AJ claims that “The government officials at TTB have little to no expertise in health. A better choice might be the Food and Drug Administration (FDA).” AJ provides not a scintilla of evidence that FDA would or could do any kind of a better job with a single one of the issues noted above. FDA might be far more likely to allow vitamins in vodka and on the label. FDA does not police the term natural more strictly compared to TTB. FDA would not be likely to restrict the use of organic claims or disallow MGD from marketing itself as low in calories. In view of the weak examples set out by the report, and with few if any meaningful health claims getting past TTB, it is a wonder to behold what more rigorous enforcement would look like. Should the government ban imagery associated with sound, ripe fruits (because they are “wholesome” and booze is not)? Should Baileys be stripped of all rights to mention dairy cream (because it’s commonly associated with healthfulness)? Another charade in which the industry engages to keep regulators at bay is to argue that the free speech clause under the First Amendment protects companies from any government regulation of advertising. This makes for good political posturing, but from a legal standpoint, it’s simply not true. The First Amendment does not protect deceptive advertising. The government can and should stop such practices. This would be damnable if it were true. Is anyone arguing the First Amendment protects companies from all advertising regulations? The part that’s simply not true is to suggest that a meaningful number of alcohol beverage companies make this claim. I am not aware of any alcohol beverage company above a handful of employees that has or would make an extravagant claim of this sort. Most of them favor and support a wide variety of sensible controls on labeling and advertising. To put things in perspective, Dr. David J. Hanson has a detailed overview of AJ and Marin (and its funding, methods and history) here. He explains that it’s nothing new for the group to “[crusade] against First Amendment constitutional free speech rights” in pursuit of its prohibitionist agenda. It’s not like I left out the better examples, or the better arguments. 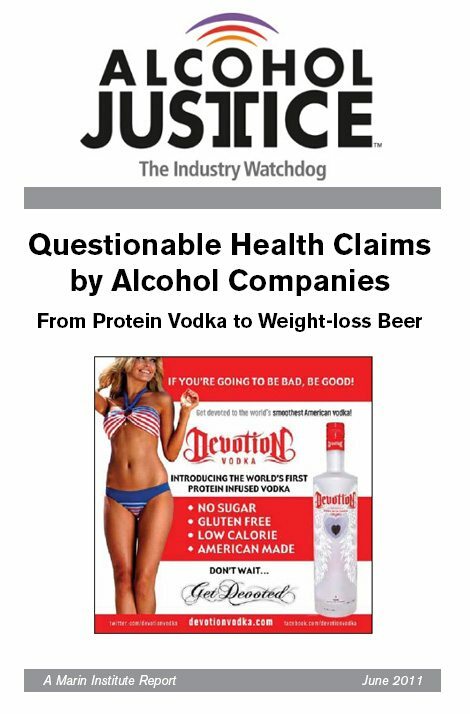 With even the protein-infused vodka (Devotion), where is the actual, documented harm, as opposed to some vague possibility? I would have liked to find more in this report with which I could agree. I do agree with the premise that alcohol beverages still, after all these years, can raise difficult societal and public health issues, and need to be regulated with seriousness and care. But because the AJ report relies so much on exaggeration, distortion and weak examples, for me the report succeeds mostly in showing there is not a substantial problem related to health claims by alcohol beverage companies.